Yesterday I attended one of my favourite events of the year – CCS Predictions. Hosted by the very smart analyst team at CCS Insight, the event prods and pokes at some of the trends and tech vendor strategies that could lead to seismic shifts in the world as we know it. It always provides good food for thought as we work with clients to help define their strategies, and then communicate those strategies to external audiences. 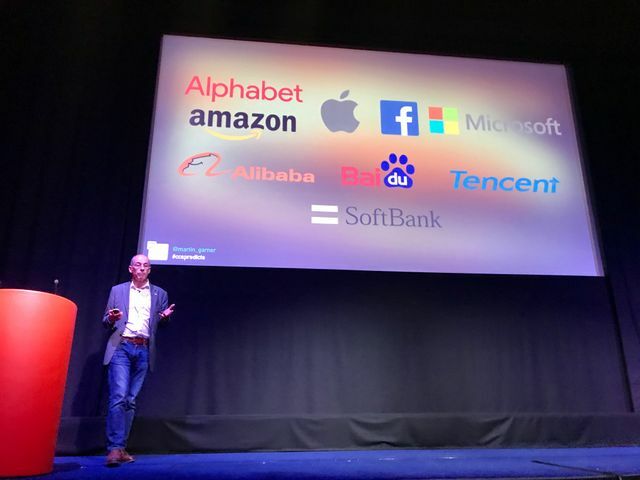 What resonated most strongly for me was a presentation about how the ‘Agenda Setters’ of today’s tech world – Alibaba, Alphabet, Amazon, Apple, Baidu, Microsoft, Facebook and Tencent – are constantly setting new industry records for what can be achieved. Alibaba’s recent Singles Day saw the company take $25.4bn in 24 hours….. twenty four hours. CCS Insight analyst Martin Garner told us that is almost equivalent to the GDP of Estonia. If Singles Day 2017 was a country, it would be the 111th biggest country in the world. That is truly remarkable. With billions of users, Agenda Setter companies are now making trillions of dollars. To maintain the pace of growth they’ve become accustomed to, being highly acquisitive and treading on the toes of other vendors and industries is all part of the day job. But it’s not all sunshine and smiles, and the CCS analysts flagged how pending regulation and China will be major challenges for Agenda Setters in coming years. The CCS team predicted that Facebook would become the first internet service to become regulated in the US by 2020. If this happens, and if other Agenda Setters and countries follow suit, will the pace of innovation slow, or might we find greater variations in their services from one geography to the next? As for China, with more patents filed in recent years than any other country – and with its own home-grown Agenda Setter, Tencent, being the most acquisitive company in Silicon Valley today – CCS predicted that China will surpass the US for leadership in AI by 2022. Whether these predictions come to fruition or not, it will undoubtedly be interesting to closely watch the Agenda Setters over the coming years. For now, I’ll leave you with a prediction of my own: by the New Year another industry record will have been broken by one of these guys. Please get in touch if you’d like to talk about Analyst Relations – adele.breen@hotwireglobal.com.